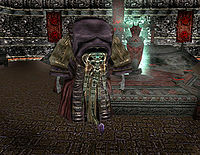 Dagoth Uvil is an Ascended Sleeper, who can be found at the Sixth House base of Kogoruhn, in the Temple of Fey. He is one of the few Ascended Sleepers capable of speech, though you'll need to sneak up on him or cast Calm in order to talk to him. Greeting 1 — %PCName. Star-blessed hero? Or the Daedra's Pawn? Only one way to find out. If you have the courage. Greeting 2 — I'm a sportsman. I'll give you a fighting chance. Go ahead. Make the first move. Topic: "Daedra's Pawn" — Have you asked yourself WHY you are doing Azura's bidding? Are you in the habit of trusting Daedra Lords? Have you forgotten what scheming, treacherous fiends the Daedra are? Come on, hero. Why are you still talking? Are you afraid? This page was last modified on 26 August 2016, at 00:57.